Sprains, strains, and active play…”I sprained my knee,” or “I have an ankle strain.” Ankles and sprains often go together in people’s minds, but beyond that, the distinction between a sprain and a strain often seems fuzzy. Strains are injuries to muscles, or to the tendons that connect muscles to bones. Strains may happen near joints, but not within joints. Ligaments are the bands of connective tissue that hold bones together in the skeleton. A sprain is an injury to one of these ligaments. Because of this, they happen at joints – places where two bones are connected. In a severe sprain (grade 3) the ligament is completely severed. If the ligament is only partially torn (grade 2), the body is able to repair itself more quickly and more reliably. In a mild sprain (grade 1) the affected ligament is only over-stretched, not torn. It can still be quite painful. Fractures are more common in children than sprains. In general, children’s fibrous ligaments are even stronger than the growing parts of their bones. Ankle sprains are easily the most common sprains in children (especially young children), followed by sprains of the knee or the wrist. Ankle sprains are also the most common ankle injuries, and knee sprains are the most common knee injuries (although a knee sprain is often referred to by the specific ligament that is damaged). 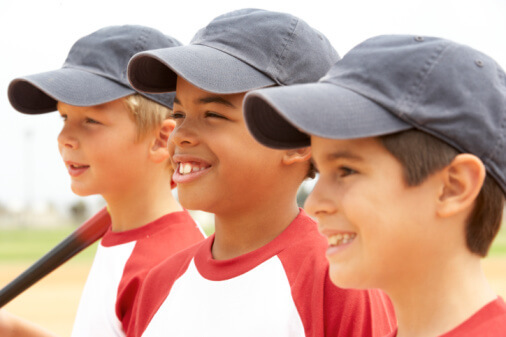 Sprains are most common among those participating in sports, but can occur in any child. They are also commonly associated with scooters, bicycles, skateboards, skates, playgrounds, and trampolines. Sprains are most common when someone who is jumping comes down on the outside of the foot in a way that stretches or tears the ligaments on the outer side of the ankle. Ankle fractures are also common in children. Mild sprains (grade 1) have mild swelling, mild tenderness, and perhaps some mild bruising around the joint. Movement of the joint may be somewhat decreased. In a mild ankle sprain there may be some limp, but children are able to walk and perhaps even to hop. Moderate sprains (grade 2) are accompanied by more swelling and more tenderness (a greater degree and also more of the joint feels sore). There is usually bruising around the joint, and movement of the joint is decreased. Children with moderate ankle sprains are unable to run or hop, and can walk only with an obvious limp. Severe ankle sprains (grade 3) have obvious bruising, accompanied by diffuse swelling and tenderness around the joint. The joint is obviously less mobile. Children with a severe ankle sprain are usually unable to bear weight on the ankle. Mild sprains usually heal within 2 weeks (often sooner). Moderate ones usually heal within 4 weeks (and often sooner than that). Severe sprains usually last longer than a month, and some will not heal without surgery. A sprain may sometimes be diagnosed based on the story and the physical examination. Sometimes x-rays or other imaging studies are needed to clarify the diagnosis and rule out a fracture. Rest, ice, compression, and elevation (R.I.C.E.) are the foundation of sprain treatment. Moderate or severe sprains may need a splint or a cast to hold the injured joint in the right position for healing. Exercises are often prescribed to speed healing. Some moderate or severe injuries may also benefit from physical therapy. Some children with severe sprains require surgery to repair the damaged ligament. Active play is wonderful for children (and for adults!). Many sprains can be prevented by supervising children during active play. Children’s sports should be a vehicle for teaching safe play. Once a joint has been sprained, repeat sprain injuries are common. These may often be prevented by correctly rehabilitating the joint after the first injury. Wearing high top shoes can reduce ankle sprains.